There is no game bigger than golf on the Monterey Peninsula. And there was no insider as connected and beloved as RJ Harper. His real name, Robert Thomas Harper Jr., that came to be “RJ” after a hometown newspaper misidentified him, the story goes. 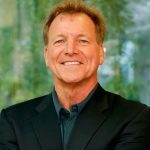 RJ rose through the ranks of the Pebble Beach Company from golf course marshal to the head of golf operations. From the maintenance workers tending the iconic greens, to the captains of industry and celebrities he hosted at Pebble Beach, Harper was known as “Mr. Pebble Beach” – a spreader of goodwill for 32 years. Harper’s 14-month battle with pancreatic cancer ended last November, but the 61-year-old’s impact on local apprentices of the game will endure through the RJ Harper Memorial Scholarship Fund. 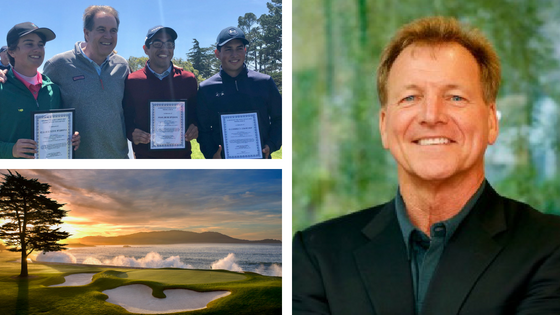 The endowed fund was established at the Community Foundation for Monterey County by the AT&T Pebble Beach Junior Golf Association with support from the Jim and Linda Tunney Fund of the Community Foundation for Monterey County, the Monterey Peninsula Foundation, and friends. It aims to provide scholarships to college-bound golfers who participate in the AT&T Pebble Beach Junior Golf Association. The fund is already doing Harper’s work. Palma High School graduating senior Joey Burlison was recently awarded a $5,000 scholarship from the fund. 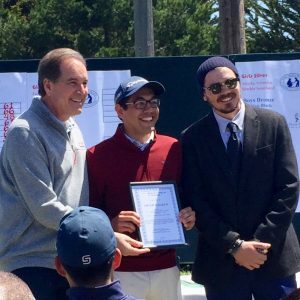 Jim Nantz, long time CBS golf, football, and basketball commentator and local resident, presented Burlison with the award and took time for a sit-down interview with the young golfer. Burlison is headed to NYU Stern School of Business and will be playing golf for the school. Contribute to the RJ Harper Memorial Scholarship Fund online www.cfmco.org/rjharper or by sending a check to the Community Foundation for Monterey County with “RJ Harper” in the memo line to 2354 Garden Road, Monterey, Ca 93940.